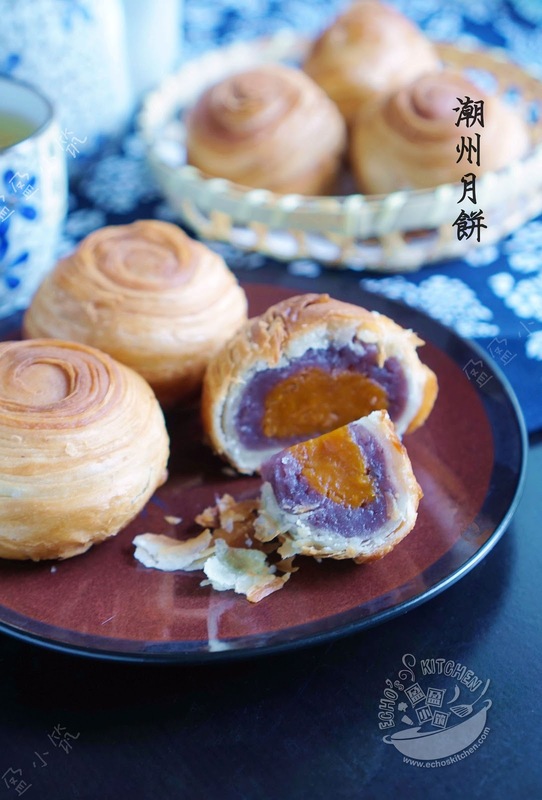 With Mid-autumn festival just around the corner, it is the time of the year again to enjoy the mid-autumn delicacy Mooncake. I made the cute piggy mooncake using the Cantonese mooncake recipe before. This year I decided to try something different and go all the way traditional to make this very old fashion Teochew "Orh-Nee" Mooncake. 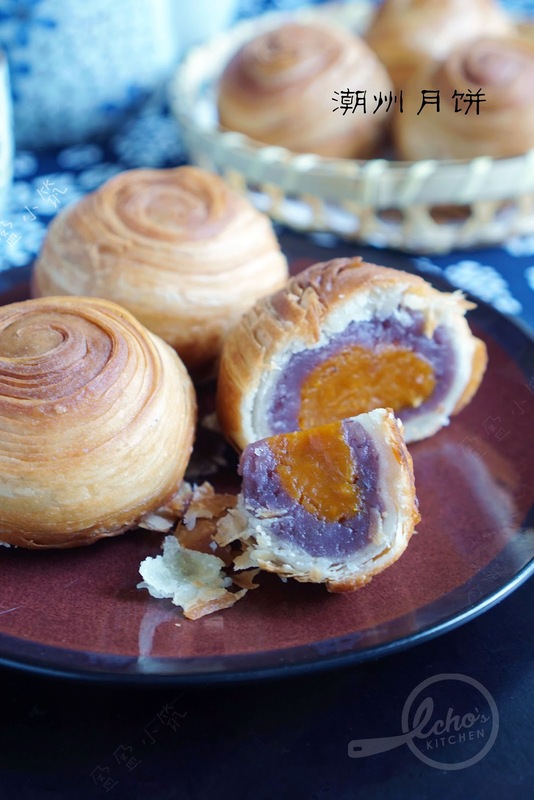 With pumpkin in the season, I even substitute the egg yolk with pumpkin paste filling, which to my great surprise, turned out to be super tasty and looks almost identical to egg yolk!A delightful surprise indeed! 1. 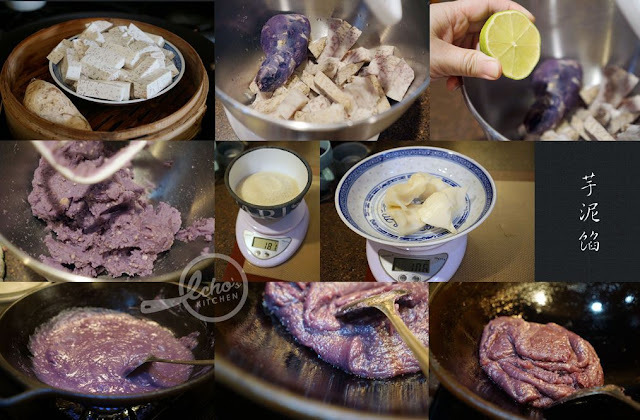 Cut Taro/yam into pieces and steam it with purple yam for 45-60 minutes or until soft. Peel the purple yam's skin and place the cooked yams in a stand mixer or food processor. 2. Mash the yams into a paste using stand mixer or food processor, add sugar and lard and continue to mash until the mixture is smooth. 3. 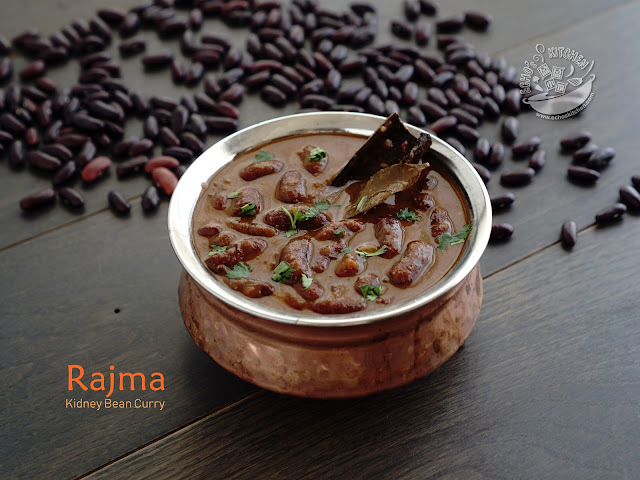 Place the mixture in a cooking pan and cook at medium heat, stir continuously to prevent sticking to the bottom of the pan. Cook until the mixture form a soft dough. Let cool and divide the paste into 16 equal parts, around 40 g each. 4. Cut Kambocha pumpkin into pieces and steam for 45-60 minutes until soft, scrape out the tender flesh using a metal spoon, discard the skin. 5. Place the cooked pumpkin, sugar, lard and 2 tbsp of all purpose flour in a bread machine and run the Jam function to a full cycle. 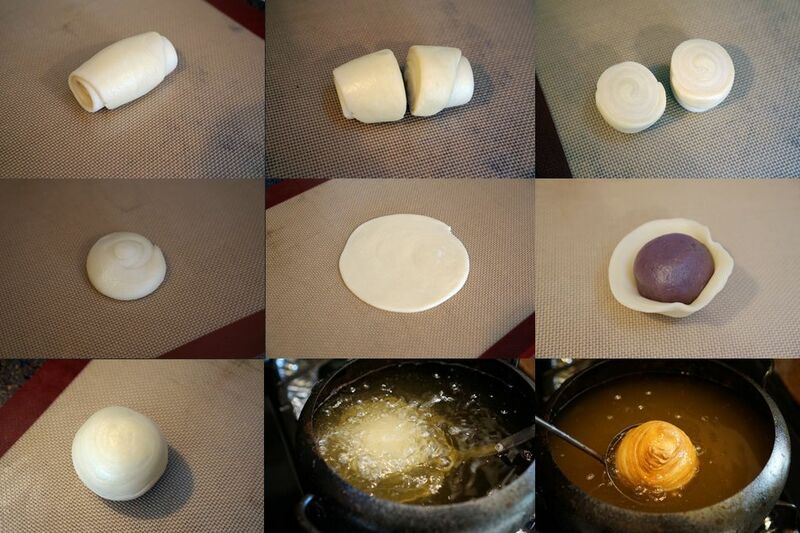 You can also do this by mashing and cooking the paste on stove top. I let my bread machine take care of the pumpkin while I worked on the Taro. 6. 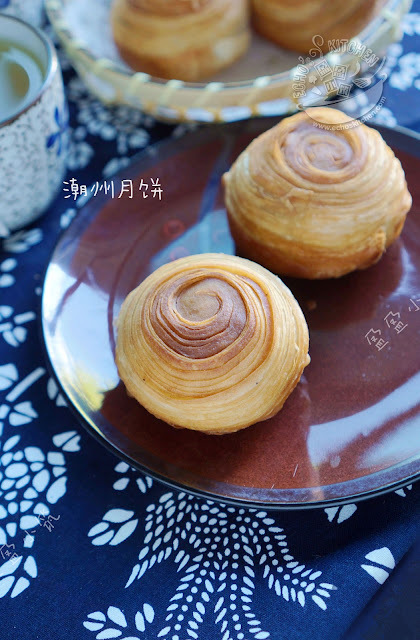 Take the pumpkin paste out once the Jam cycle is done and the paste turn into a soft dough, if it is still runny, run the cycle once more until the desired consistency reached. 7. Let the pumpkin paste cooled and divide into 16 equal parts, around 18-20 g each. Roll each portion into a small ball and refrigerate for 20 minutes. 8. 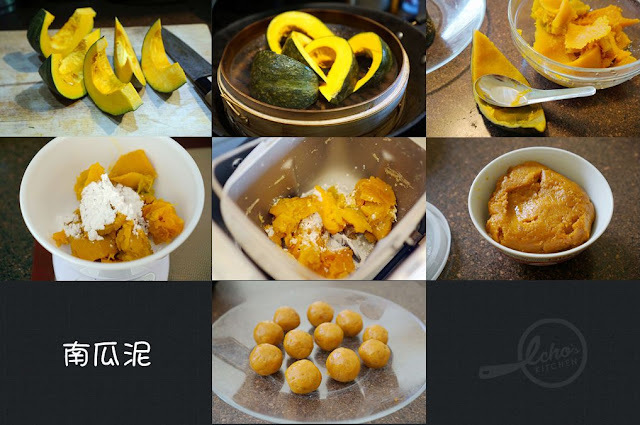 Take one portion of taro filling and lightly press with thumb to form a small bowl like shape, place one pumpkin ball in it and wrap up to form a larger ball. Repeat the steps for all the fillings. Refrigerate for 20 minutes before use. 9. To make the water dough, combine all purpose flour, lard, sugar and water to form a soft dough. Let it rest for 15 minutes before kneading again to form a smooth dough. Rest the dough for 15 more minutes before dividing it into 8 equal parts, 62 g each. 10. To make the oil dough, combine cake flour and lard by slowly pressing and mixing the two using hands to form a dough. Divide the dough into 8 equal parts, 38 g each. 11. Take one portion of water dough and with the help of rolling pin, roll it out to form a disc around 4 inches in diameter. 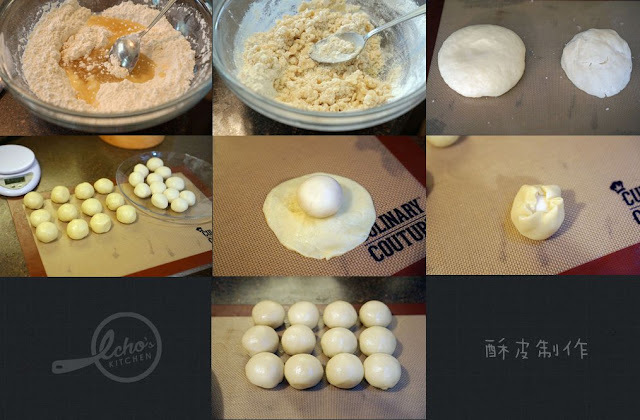 Place one portion of oil dough in it and wrap up, pinch to seal edges and roll it into a larger ball. Repeat the steps for all the dough. Let the dough rest for 15 minutes. 12. Take one portion of the dough, with the sealed side facing up, roll it into oval shape using a rolling pin. Roll it up tightly like a Swiss roll to form a cylinder. Turn the roll 90 degrees with the end facing up. Repeat these steps for all the dough portions and let the rolls rest for another 15 minutes. 13. 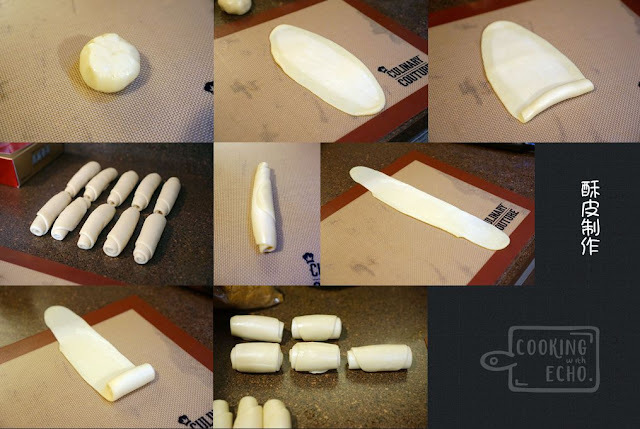 Take one roll with the end side facing up, roll into a long thin strips with the help of rolling pin. Roll it up again like a Swiss roll to form a shorter but thicker cylinder. Repeat the steps for all the rolls. 14. Cut the roll into half using a sharp knife, with the incision part facing down. 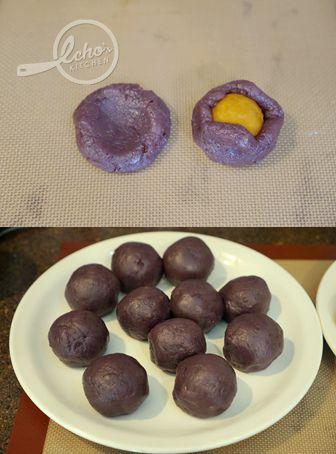 Flatten the half dough to form a round disc, place a taro pumpkin ball on it and wrap up, pinch to seal and make into a round ball. Repeat the steps for all the remaining ingredients. Let the pastry rest for 10 minutes. 15. Heat up 5 inches of oil in a deep fryer, with the help of a strainer/stainless steel slotted spoon, place the pastry in oil and fry on medium heat until golden in color. Fry the pastry one at a time to have best results. Note: Allow the pastry to cool before placing into container, this mooncake is best consumed within 24 hours when the crust is still crispy.